BROOKLYN, NY - January 2, 2018 - Shema Kolainu - Hear Our Voices (SKHOV) - proudly presented its Chinuch Excellence Award to the Elyon Seminary at a Breakfast Recognition Ceremony held in the SKHOV headquarters. The honor recognizes the Seminary's superior mainstream, hands-on general and special education programs. 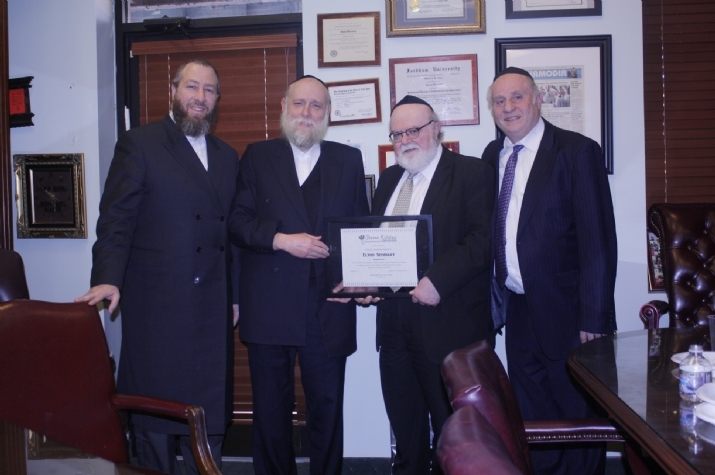 The award was presented to Rabbi Chaim Waldman, President of Elyon, by Dr. Joshua Weinstein, Founder and President of SKHOV, a nonpublic, nonprofit, nondenominational, multi-cultural school provides quality education, treatment, professional training and mentoring. SKHOV is at the forefront of addressing the needs of children with autism and other special needs in New York City, and offers a broad spectrum of evidence-based education and therapeutic programs in a warm and nurturing environment. The two revered institutions share a goal to foster within each student a sense of self-esteem and a desire to make a positive change in society at large. Innovative programs challenge students to achieve their full potential and develop a love for lifelong learning. Dr. Weinstein noted that SKHOV's highly intensive programs require teachers with specialized training and/or a Seminary degree to work with children who need extra academic support. "Unfortunately, we often find that students straight out of high school are filling these teaching positions and are not sufficiently qualified for this vital role," he said. Dr. Weinstein lauded Elyon's premier program for young women interested in teaching students with autism and other related special needs. The curriculum offers qualified students a professional training environment with hands-on exposure to best satisfy our community's educational needs. Not all programs are equal and are able to offer qualifying degrees in a proper environment suitable for a toradig bas yisrael. The program offers seminary studies with courses geared toward earning a Seminary degree from an accredited academic institution, affording graduates the opportunity to teach in Yeshiva and Bais Yaakov educational programs. "Elyon has a proven track record of preparing the future teachers of our community, said Dr. Weinstein." Their graduates have made a tangible impact on our students, and be'ezras Hashem, will continue making a real difference in the lives of many more in the future." 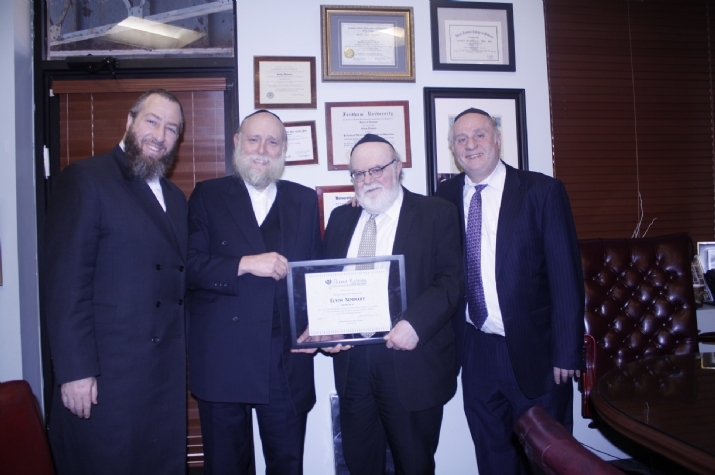 In accepting the award on behalf of the Elyon Seminary, Rabbi Waldman proudly noted that graduates are sought after as desirable, skilled professionals. "Our alumni have, and continue to have, a profoundly positive impact on the educational lives of their students and their families," he said. "They personify lilmod u'lelameid by transmitting the Torah values they gained at Elyon to future generations, and have a proven track record of preparing the future teachers of our community." Also attending the reception were longtime SKHOV friends and supporters Ezra Friedlander, Founder and CEO of PR firm the Friedlander Group, and Rabbi Motty Katz, of the Jewish Education Program and admirer of Elyon Seminary.